In most situations, surface mold can be removed from artwork using a vacuum cleaner that does not exhaust the spores back into the room. A vacuum fitted with the proper filtration system is recommended. Whether it comes from a devastating hurricane, unexpected flood or simply excessive humidity at home, excess water can create a potentially dangerous situation for collectors: mold, which should always be treated very carefully. But never fear; there are several institutions can salvage mold- and mildew-covered artwork and antique items. Your first priority should be to protect yourself against any health and safety issues associated with exposures to dangerous mold. There are different types of mold. Some pose little or no hazards to humans while others can be toxic. The dangerous molds, such as Stachybotrys or Chaetomium, can cause serious illnesses. I would suggest that any visible mold should be considered a danger that requires immediate attention and safe handling. Stachybotrys is a greenish black mold that grows on material with a high cellulose content, including building materials such as wood, drywall, wallpaper, insulation backing, cardboard boxes and fiberboard. This mold requires very wet and humid conditions for days or weeks in order to grow. Chaetomium is a common fungal species that is frequently found on deteriorating wood products and often emits a stale, musty odor. Chaetomium colonies are fast growing and start off white in color. As they mature the colonies become gray to olive-green in color. Mold removal and treatment should usually be performed by trained mold remediation professionals. When inspecting or retrieving salvageable possessions from a flooded building it is important to wear the proper personal protective equipment. Use a respirator/dust mask that has a NIOSH rating of N-95 or higher. The mask must fit and be worn properly. Wear disposable latex gloves and coveralls, as well as goggles for eye protection. Limit the time spent in areas where mold levels are high to 15 minute intervals. Some molds can be toxic, so it is important to wear the appropriate protection, including gloves and a proper respirator or dust mask. Under no circumstances should chlorine bleach be used to clean the surface of any work of art, frame, photograph, document or other antique items. 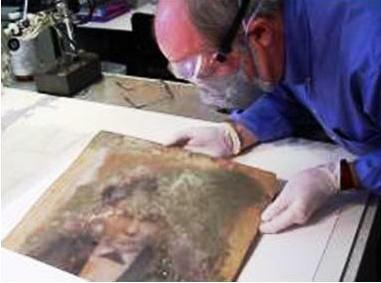 An experienced art conservator should be consulted for assistance in dealing with mold-affected materials. In most situations, surface mold can be removed from artwork using a vacuum cleaner that does not exhaust the spores back into the room. A vacuum fitted with the proper HEPA filtration system is recommended. Special attachment micro-tools, speed controls and screens are used by conservators when vacuuming to prevent damage to the art. After the surface is cleaned of visible mold, the item is subjected to controlled ultraviolet light. Tests are then conducted from surface samples to verify that mold is no longer present. After cleaning, items should be placed in a clean and protected environment with low humidity. For more information about restoring a painting that has acquired mold, or any other restoration project, visit the Old World Restoration website.